My first experience on a “social network” was AOL Instant Messenger, back when I got my first computer with internet access in third grade. My username, created by my older brother, loosely resembled a strange commitment to my full name, my street name, and a series of random numbers – camerontaft17356. Little did I know that these humble beginnings of posting away messages and chatting with friends in my class would eventually turn into a significant portion of both my personal and professional lives. Early impressions and expectations of this class, after hearing about it from a roommate who took the class last fall, included classes on how to use social media, what is good and not good about social media, etc. Despite the class being offered by Boston College, it is easy to imagine a class about social media being an easy class. When I spoke to my parents, brother, and friends about the class, they could not believe I was going to be taking a class like this at BC, commenting that I should be spending my time on something more concrete and important as part of my business education. My belief all along? They could not be more wrong! Professor Kane’s mission on day one: ensure people know that this is a serious course, not a walk in the park. This mission, as evidence by the 15 students who dropped out after the first class, was a success. Those who were still intrigued enough by the class and not afraid of the work were left to experience what is sure to be a deeply interesting semester. We were encouraged to stick with the class because it really is so current and relevant. The class’s fluidity year to year means that we, as students, gain the best possible learning experience from a highly relevant field—digital technologies in businesses. Social media in particular has become an increasingly prevalent and critiqued part of my generation’s identity. We grew up at the same time new digital technologies and internet ventures began to really come to fruition in an affordable and accessible way. Where many of those in my generation were likely introduced to social media websites through the likes of MySpace and later Facebook, we are now using Facebook, Twitter, Instagram, Snapchat, Linkedin, Pinterest, Tumblr, and so many more. We have evolved from using one or two platforms to using several, sometimes so many that I forget usernames and passwords for some websites that I don’t often use. The figures are pretty staggering. According to the Pew Research Center, 79% of all online adults and 88% of online people aged 18-29 use Facebook. 59% of those same people use Instagram. Nearly three out of four Facebook users are on the site daily. These numbers, taken from a 2016 survey, show a significant increase even from the 2015 survey. Further studies that take place in present day are likely to show additional increases given improved features on platforms and continually increasing access to Internet services across the world. As the number of users continues to grow, the nature of “user-ship” has evolved. The way we fundamentally interact with many of these platforms has changed. This is something easily evidence by those of us who began using Facebook in middle and early high school. Before we were warned of colleges and employers eagerly searching our social media accounts for reasons to deny us from a position, before the novelty of social media wore off, social media was a very different outlet for us. Taking a cursory look back at the beginnings of my Facebook account makes one thing very clear: I posted about everything. Small thoughts throughout the day, random things that happened to me or my friends, scores of my middle school hockey games, gifts I received for Christmas or my birthday – basically everything. However, if you look at how I use my social media platforms today, it is very different. And this difference is not just with how I use social media, it is pervasive across users. Content is no longer posted on a whim, but rather highly curated – especially for “permanent” platforms like Facebook and Instagram, compared to the temporary nature of platforms like Snapchat. Wording of text, coloring and angle of photos, even the captions under photos are all chosen very carefully so as to present a certain self. Whether we are aware of this or not, we continually craft a story that we want to tell to others. Becoming aware of this allows users to craft a more authentic story, rather than one we simply want others to see. As part of this class, we will learn how businesses strategically use social media and digital business technologies as part of their operations. It will be interesting to compare and contrast the evolution of social media use in the professional space with the personal space, especially as those two worlds seemingly become more intertwined on a daily basis. I thought the statistics from the Pew Research Center you provided was pretty intriguing. 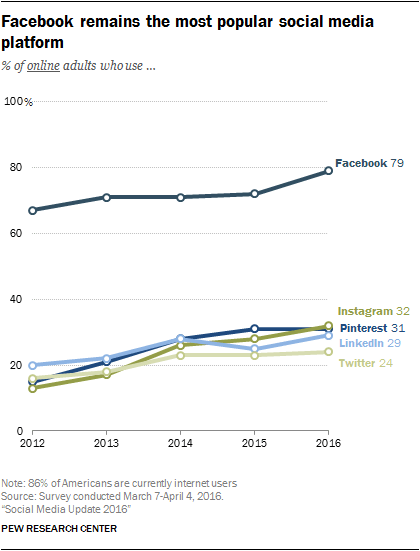 If 79% of all online adults are already on Facebook, it seems the market is saturated. I am curious to see how Facebook will not only target the remaining 21%, but also how they plan on retaining the users they have and enticing them to use it on a daily basis. Are users choosing to post content with more caution, or are they simply getting bored of it / using it as a medium for passive information collection? I actually argue that it’s natural (even necessary) for your social media usage to change as your mature. Just as people of different stages have different social needs, so different platforms will meet those needs differently. Facebook just wants to be “the one to rule them all.” Hopefully you’ll be able to go back at CHristmas and prove your family wrong! I really agree with your idea of us going above and beyond to create an image of ourselves through our social media accounts. The one part I would question is whether or not we truly make this authentic or if we are posting for others. Are we truly trying to showcase what we like, or are we trying to get the most likes/shares? Great statistics. I am not sure i saw it but now FB has 2.1 Bn monthly users. That is way too much, 1/3 of the world!! now add up all other Social Media platforms. I also have some stats on my blog and an evolution of when it all started in case you want to visit. Social Media is changing and I agree this class is to learn how to use it, how it’s changing and how will it impact us students looking for jobs and interacting on the web. Great post. Cam, I hope you can prove to your friends, family, and brother how useful this class will be. Tonight’s discussion really proved how digital and how technology is changing everything from how we interact to how companies are organized. I’m excited to take this class with you and hopefully we can make connections from our Technology in Society class we took abroad!